The largest colony is the Bass Rock in the Forth of Firth in Scotland, after which the birds take their Latin name. The birds have been protected in Iceland since 1940 and Eldey is now a sanctuary, visited only by scientists. 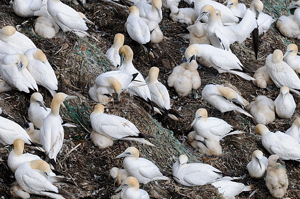 However, gannets nest elsewhere, including the sea stacks in north east Iceland at Rauðunúpur and Langanes. Here they are sufficiently close to the coast to allow good views of the birds from the cliff tops. Time spent here observing their behaviour is rewarding and as the summer progresses it is possible to get good views of the maturing chicks. 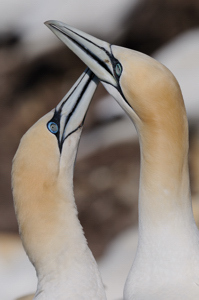 The last few decades have seen gannet numbers increase. They have fared better than puffins and guillemots. as they are strong fliers and can forage further and dive deeper in search of food. They are not so dependent on the fluctuating numbers of sand eels. 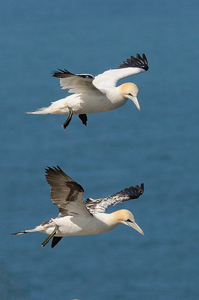 Unfortunately, in recent years, fewer adult pairs are making the effort to nest. It may be that worsening storm conditions in the open ocean where the birds spend the winter months are disrupting their feeding patterns and they no longer have sufficient energy reserves to breed come the spring. More research is needed to better understand this worrying trend.